I have a great guest post for you today from Michael who blogs over at Stretch a Dime. 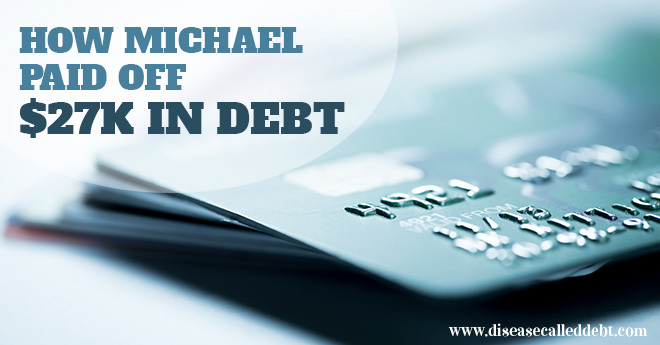 If you’re looking to pay off debt yourself, I’m sure Michael’s debt success story will inspire you. When you’ve read this, you might also want to read more debt success stories here. Take it away, Michael! 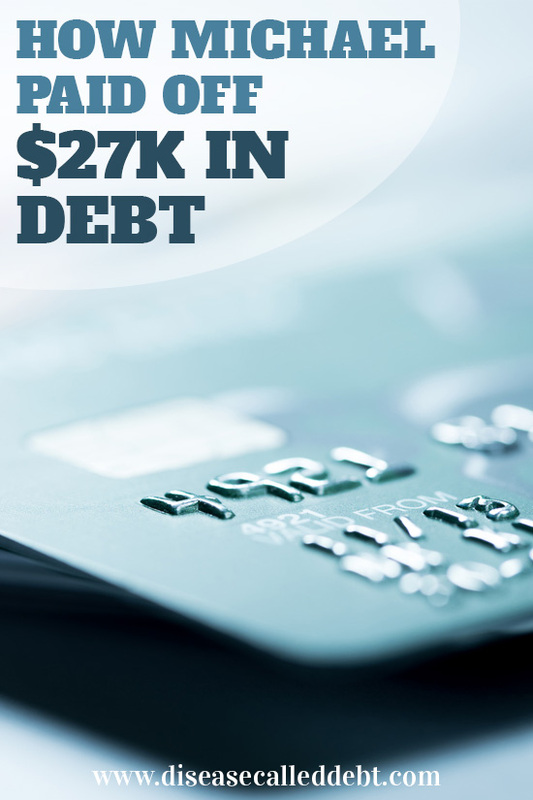 When I was in my early 20s, I was carrying a huge credit card debt of about $27,000. No one taught me about finances and I just bought whatever I desired without any financial accountability. The truth is I didn’t even know how much I owed in credit card debt. You want to know why I didn’t know how much I owed? I was afraid to look at it. I lived in denial paying only minimum balances and late fees. In general, to address any problem, you must first accept that you have a problem, then you must quantify it, and finally face it head on, especially debt. Soon, all my credit cards were maxed out. Finally it dawned on me that something needed to be done. So, I opened a spreadsheet and listed all the credit cards I had and how much I owed on each of them. The total came to a whopping ~$27,000. “Accepting and quantifying” was completed. I locked away all my credit cards. I carried only one credit card in my wallet for any emergencies. I went on a total spending freeze – cut Cable TV, cancelled my cell phone (yes I really did), rarely ate out. Anything I could live without, I cancelled. Friends would invite me and my wife to eat out after church – I would politely decline and say that I was paying off debt and couldn’t afford to eat out. People understand and respect you when you say that. It took a lot of courage and humility. I accounted for every penny I spent – yes I logged all my expenses into a spreadsheet. I put a budget together, lived within my means, and stuck to the plan. I paid for all expenses using debit card and checks. I used the surplus at the end of the month to pay off credit cards. I started with the card that had the least balance. I believe it had a balance of about $250. I paid it off, cancelled it, cut it up, and threw it away. This was my first victory. This gave me a morale boost and pumped me up on the journey. Then I tackled one that had a higher balance. Eventually I got down to the last two cards with the highest balances. By this time, my credit union believed in me and helped me consolidate my debt into a single personal loan. The interest rate on the loan was orders of magnitude less than how much the credit cards were charging in interest. I had accumulated the debt over a three year period. I spent the next three years of my life paying off debt. As soon as I paid off my last credit card, it felt so good to be debt free. It felt like I had my head above water and I was able to breathe air again. I had accumulated this debt when I was single. My wife was very supportive all through this time and helped in managing and paying off the debt. I am extremely thankful to have a wonderful, wise, and supportive spouse. In Oct 2015, according to Nerd Wallet, “The average US household credit card debt stands at $16,140.“ If you are in credit card debt, I hope that you make the choice today to get out of debt and out of these statistics. Get out of debt: If you want to get out of debt, you could follow my approach. How drastically you cut down your living expenses depends on how badly and how soon you want to get out of debt. Imagine that you are a bull fighter and debt is the bull. It is either you or the bull that is going to walk out of the arena. I say, slay the bull! Stay debt free: After you pay off your debt, continue to pay all your bills and expenses using your debit card, checks, and online bill pay that is linked to your bank account. Live a debt free lifestyle for at least 3 years so that it becomes second nature to you. Then consider using one credit card in a responsible way by paying balances off on a monthly basis. You get only once chance. If you don’t pay off your monthly balance in full, then you aren’t ready for credit cards. Go back to using debit cards / checks / online bill pay. I cheer for you to get out of debt! Author Bio: K. Michael Srinivasan is the author of the personal finance blog Stretch A Dime, where he writes about Personal Finance, Investing, and Frugal Living. Thank you for the opportunity to guest post on Disease Called Debt! Great story. It looks like the author was very realistic in that it would be hard work and that there wouldn’t be shortcuts. I think it’s important to be able to celebrate the milestones along the way which give you continued motivation to keep trucking. Thank you! Yes, it was hard work. Every small victory built my morale up to go further. The light at the end of the tunnel was getting brighter with each small victory. You are right, it is important to pause and have a mini celebration as you hit each milestone responsibly. What a great and inspiring story! Congratulations on your hard-earned success! Congrats on paying off that debt, Michael. I’m impressed that you gave up your cell phone. So often we talk ourselves into believing that we “can’t live without” some of our expenses when they are not absolutely necessary. Thank you, Gary! Giving up the cell was tough, but doable. On occasions when I had to make an urgent call, I had to stop at a gas station and use a pay phone. Secondly, people look down these days if you don’t have a smart phone. We need to ignore and do what is right for us. I particularly love how you came out to friends inviting you to dinner, how you were honest about paying off your debt. I think people would get out of trouble sooner if they had the courage to open up about such a subject (especially since it’s something to be proud of, not ashamed). Thank you! The first couple of times I found it very difficult to openly say it – everything in me resisted it but I had to overcome it and just say it. However, the opposite was true. When I was honest and humble, people respected me more. Once I realized it, it became a lot easier. Congrats Michael. I feel you there. It’s really hard to pay it off, but when we have dedication and we’re really serious that we can pay it off. That’s when it becomes achievable. Thank you, Jason! It comes down to belief. Often times, we believe we can’t and we don’t even try. In case of debt, paying off the card with the least balance made me believe that it was possible. If I could pay this one card off, I could pay off the next one and so on. This kept me going. We need to take a moment to celebrate each victory along the way. Interesting theory on going back to using credit cards. I’ve fallen into the debt cycle with them twice, and am ready to swear I will never use them again. But maybe after 3 years of being “clean” (ha!) it would make a difference. It was my personal conviction that I had mastered living within my means when I had abstained myself from using credit cards. Honestly, I was so scared to use a credit card after three years. I was afraid that I would go back into debt. So, I was very overly paranoid in watching what I used the credit card for and was religious about paying it off in full on a monthly basis. You need to be extremely cautious with it. If you have already fallen twice, I think you may be better off abstaining yourself longer or just not use credit cards. Slay the bull! Heck, yeah! That’s also awesome that your credit union helped you out with a personal loan, that’s definitely a smarter way to pay off debt with a much lower interest rate than most credit cards! Thank you, Mel! I am glad you like slaying the debt bull:) Absolutely, agree. The credit union was of great help. The personal loan from my credit union was half of what the credit cards were charging me. With that experience and learnings of Michael, I believe he can pull it off. He can be debt free for another 3 years. Good luck Michael. Thank you, James! If we prioritize and put our minds to it, all of us can be debt free. and there are solutions.Good advice. That’s a practical method anyone should be able to follow if they get into the same situation. Thank you! Yes, it is a very practical approach. The key is to stick to the discipline and just plow through it.